ISLAMABAD: The Islamabad High Court (IHC) on Thursday took up a petition seeking the constitution of a commission to probe how the Islamabad bound PIA flight PK-661 crashed near Havelian on Dec 7, 2016. The relatives of two of the passengers on board the plane filed the petition in which they have asked for an independent investigation commission to find out the cause of the accident. PK-661 took off from Chitral and crashed near Havellan, killing all passengers on board, including renowned singer turned evangelist JunaId Jamshed. IHC Justice Aamer Farooq took up the petition and after hearing the preliminary arguments, asked the petitioner`s counsel to come up with relevant sections of the law to support the petition. 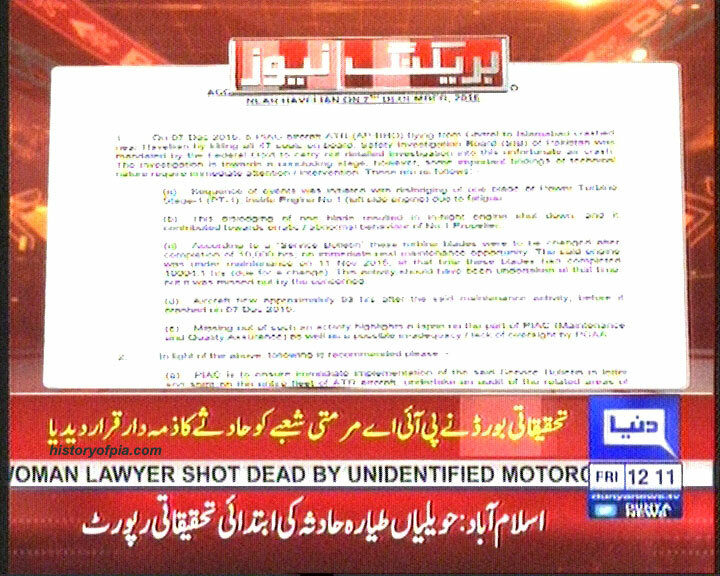 The petition has been filed by Shahida Mansoor, the mother of Ahmed Mansoor Janjua, who was the co-pilot of the plane and Atia Naz, the sister of Khawar Sohail, who was also killed in the crash. They have cited the federation of Pakistan through the secretary Ministry of Defence, DG Pakistan Civil Aviation Authority, PIA chairman, chairman National Disaster Management Authority (NDMA), Pakistan Institute of Medical Sciences through secre-tary health and the Capital Development Authority through its administrator as respondents. The petition says that instead of checking the air-worthiness of its planes, the PIA staff sacrificed black goats in order to seek divine protection for their aircraft and passengers and claims that crash was a result of PIA incompetence. The petitioners have also questioned the ability of NDMA and PDMA for handling air crash incidents and have asked the court to direct the two authorities to formulate standing operating procedures for rescue services in cases of air crashes. The court adjourned further hearing till next week. PESHAWAR: Member National Assembly (MNA) from Chitral and brother of one of the victims of a Pakistan International Airlines flight crash on Thursday moved the Peshawar High Court (PHC) seeking directions for the government to release final investigation report and compensation to legal heirs of the victims. The petition was filed by Shahzada Iftikharuddin, MNA from Chitral, and Adnan, brother of the victim Salman, through Barrister Asadul Mulk. The government of Pakistan through secretary Aviation Division, Pakistan International Airlines Corporation through its chairman, Pakistan Civil Aviation Authority through secretary Civil Aviation Authority Board Headquarters and cabinet secretary, government of Pakistan were made respondents in the petition. 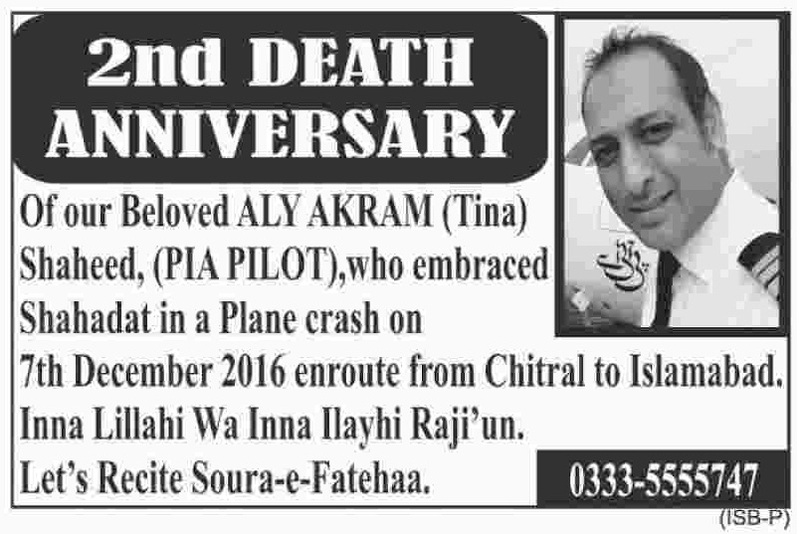 The tragic crash of PIA flight PK-661 occurred near Havelian on December 7, 2016, ending the lives of all 47 people including Junaid Jamshed and Chitral Deputy Commissioner Osama Waraich on board, while en-route to Islamabad from Chitral. “The petitioners being aware that investigation into the causes of the crash of PK -661, like any other air crash investigation, would take time, patiently waited for the final report. original statements and assured the family members of the deceased victims the report would be released in a year. It was pointed out in the petition that now more than a year had passed but the respondents were still unwilling to committing themselves to a timeline and propose a date or a tentative date for the release of the final investigation report of the tragic plane crash. The lawmaker stated that in his capacity as an elected representative, he was duty bound to convey the plight of the aggrieved families, approached various authorities at different levels, including the Prime Minister of Pakistan, who informally relayed to the respondents to disclose the final investigation report as to know the actual causes of the crash. Unfortunately, he stated even the kind intervention of the prime minister does not yield much results as the premier is furnished with vague and evasive answers by the respondents each time he pushes for a disclosure. As a result of the non-disclosure, it was stated, not only families of the victims are being kept in the dark but their right to make an informed decision regarding whom to sue and on what grounds is being forcefully forfeited. In grounds of the petition, it said the failure to disclose necessary/relevant information and the final investigation report probing the causes of the crash of PK-661 is in violation of the Article 19-A of the Constitution of Pakistan 1973, which guarantees freedom of information. It said that even if the delay in the release of the investigation report has been caused due to technical and scientific causes beyond the capability of the respondents to expedite, even then the families of the victims in such circumstances have the right, in light of the above cited Article, to be kept updated on the progress being made. It added that failure on part of the respondents to assign reasons for the delay in the release of the final investigation report is improper, unjustifiable and contrary to settled jurisprudence. They requested the court to direct the respondents to release the final investigation report of the crash and release the details of all persons on board along with the quantum of compensation they have received so far and how it has been computed and to declare that failure on part of the respondents to respond appropriately to requests for information made by family members of the deceased and failure to assign reasons for delay in the final investigation report is improper, unjustifiable, contrary to settled jurisprudence. Final investigation report by SIB was said to be published in April, 2018. Today, the Supreme Court of Pakistan was informed that all afectees of PIA flight PK-661 have received compensation. Any update on the investigation report? Will it ever surface? Where is CAA? Going for fines for airlines if they are not paid but what is their role when it comes to accountability. Second anniversary of the crash. Still no information about investigation report/findings. Was just about to ask here, glad you are keeping a check and keep us updated. 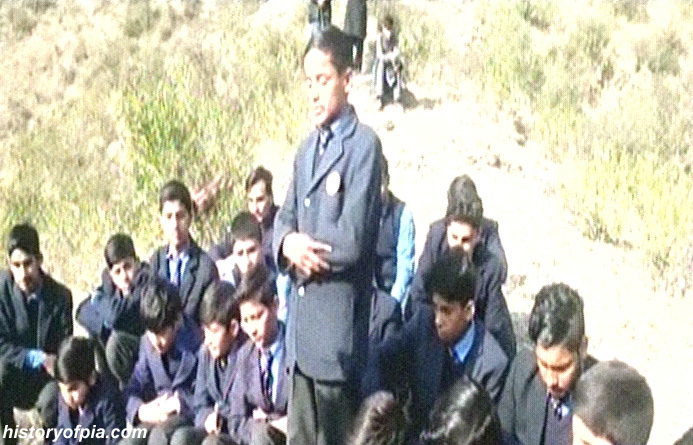 Students of a school offered prayers at the crash site today. This piece was originally published on Dec 19, 2016. I reached Abbottabad at 5pm to pick up my mother from the Daewoo Express bus station. She was coming from Peshawar, where she had landed earlier in the day on the same aircraft that crashed on its way to Islamabad from Chitral. Panic struck me as I looked at the TV screen flashing the news of the missing PIA plane. Minutes later, Deputy Superintendent of Police Havelian confirmed that the PK-661 had crashed in Havelian. I was overtaken by a sense of urgency to help. I thought of going to the crash site to douse the flames, look for survivors and rescue them. I called my colleague Additional Assistant Commissioner Abbas Shah Bukhari who was near the crash site, and he advised me to go to the Civil Hospital Havelian to make arrangements for the victims. As I reached, I was informed that an emergency had already been declared at the hospital and that the medical staff was on standby. I requested a hospital employee to take me to the crash site. We drove up on irregular tracks but after 20 minutes, we had to get off the jeep and continue on foot as there was no other way to reach the place. We came across army soldiers who were already on their way. A senior officer was instructing them on how to mount the rescue operation. Deputy Commissioner Mansehra had also dispatched Volunteer Task Force teams and ambulances to the site instantly and regularly asked if further help was needed. It was dusk when we reached, and the scene was chaotic. The plane had crashed on a steep hill and the fire had engulfed almost the entire 450 square feet area. There was a big crowd who had gathered there, many of them army soldiers. I smelt burning flesh. I saw rescuers recovering body parts from the debris, reciting the kalma as they did so. People were using chadors and dupattas they had brought from home to cover the body parts. They served as gloves for protection from the burning hot human flesh as they lifted the body parts. The bodies were charred beyond recognition. It is unfortunate we are so ill-equipped to manage such situations. I saw army helicopters hovering above the crash site, but there was no aerial drop of fire extinguishers. Gun-toting soldiers had taken control of the place but there was no proper lighting arrangement. There was no generator to light any electric bulbs. Instead, hand-held torches had to be used. We lost the battle very soon and our search for survivors came to a painful end. We then went to the hospital where the body remains were being transferred. By the time we reached, there was already a team of more than 15 doctors busy identifying the victims. It was a huge challenge for the medical staff. A team from NADRA was also present to help. Deputy Commissioner Abbottabad, Captain Jahanzeb Haider, Assistant Commissioner Abbottabad, Dr. Jahanzeb, and Assistant Commissioner Mansehra, Naveed Ahmad supervised the identification process. Colleagues and friends of Deputy Commissioner Chitral, who was one of the victims, thronged into the mortuary. Officials from the Hazara division were also present. District Nazim Chitral stayed on in the hospital for hours. By 3pm, the remains of only three passengers were identified. The doctors announced that no more bodies could be identified and that they would be shifted to PIMS Islamabad for DNA testing the next day. However, before they could be taken to Islamabad, Chief Minister Pervez Khattak demanded not to transfer the bodies before he reached the hospital at 11am. But he did not arrive on time and almost three agonising hours were wasted. After the long wait, PPP's Members of Provincial Assembly from Chitral decided to shoulder the coffins to the ambulances and send them on their way to the federal capital. I pray that all the departed souls rest in eternal peace. ISLAMABAD: The Islamabad High Court (IHC) on Monday criticised the Civil Aviation Authority (CAA) for failing to submit a report on a plane crash in Havelian in 2016. The Pakistan International Airlines (PIA) flight PK-661 crashed near Havelian in 2016 killing 48 individuals, including celebrity Junaid Jamshed and Chitral deputy commissioner Osama Warraich. The IHC expressed its disapproval as it heard a petition urging for a judicial investigation into the accident. The petition was filed by the mother of the co-pilot Mansoor Janjua. According to the petitioner’s lawyer, no commission was formed to investigate the causes of the crash. In response, Justice Aamir Farooq of the IHC inquired from CAA if an investigation was conducted and what it revealed. The CAA’s legal representative informed the court that while a probe over the matter was indeed conducted, its report has not yet been published. He explained that the relevant authority has to approve the report before publishing it. “Should I wait until my retirement then you will present the report,” Justice Farooq remarked in response. He added that two years have elapsed since the incident but its causes have still not been revealed. CAA’s legal counsel then requested the court to give the authority time to submit its report. The IHC judge remarked that the government should have directed relevant authorities to conduct an investigation into the issue. The case was then adjourned till February 7. Preliminary investigation report has blamed PIA Engineering for the accident. An engine's turbine blade separated/broke in-flight. The engine stopped after separation of blade. Left-side engine developed fault due to excessive usage. The turbine blade needs to be replaced after every ten thousand hours. The aircraft engine had undergone maintenance/repairs on November 11, 2016. The aircraft had flown ninety-three hours after repairs. Last edited by Abbas Ali on Fri Jan 11, 2019 12:20 pm, edited 1 time in total. The aircraft engine had undergone maintenance/repairs on November 11, 2016. The aircraft had flown ninety-three thousand hours after repairs. 93,000 hours can't be correct. Usually turbo prop Aircraft take 30+ years to flow these many hours. This Aircraft can fly with one engine, what was the issue with other engine? ^ Thank you Ammad for correction. The aircraft had flown ninety-three hours after last maintenance/repairs. The sequence of events began with dislodging of power turbine blade of engine number one (left-side engine).